Pantograph shutters are an attractive alternative to sliding, sliding bi-fold or wing shutters and offer interesting opportunities for architectural design. The design options are unlimited. 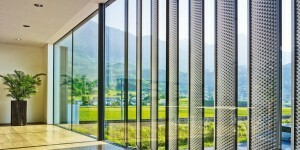 Furthermore, pantograph shutters from the Griesser Company enable special lighting atmospheres and shading effects in rooms through various opening angles. When open, the pantograph shutters are at right angles to the facade and provide privacy and protection against wind, even when they are half-open. The latest in electrical drive technology and controls ensures great convenience. Practically all of the standard wing shutter and sliding shutter models can be used as pantograph shutters. 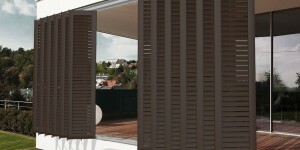 Sash with fixed 50 x 10 mm slats made of extruded aluminum, slats somewhat opened, with two dividers for reinforcement, installed in a stable, continuous 71 x 33 mm frame made of extruded aluminum, baked enamel finish with surface in accordance with valid collection. Standard-equipped with electrical shifting from open, i.e. sash perpendicular to the facade, to closed and at every intermediate position. Sash with fixed 50 x 10 mm slats made of extruded aluminum, slats somewhat opened, with two dividers for reinforcement, installed in a narrow, continuous 40 x 33 mm frame made of extruded aluminum, baked enamel finish with surface in accordance with valid collection. Standard-equipped with electrical shifting from open, i.e. sash perpendicular to the facade, to closed and at every intermediate position. Sash with fixed, stacked 50 x 18 mm slats made of extruded aluminum, slats stacked on top of one another, light-tight, with dividers for reinforcement, installed in a stable, continuous 71 x 33 mm frame made of extruded aluminum, baked enamel finish with surface in accordance with valid collection. Standard-equipped with electrical shifting from open, i.e. sash perpendicular to the facade, to closed and at every intermediate position. 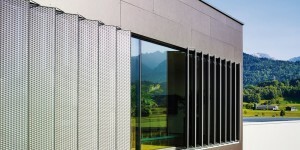 Sash with fixed 60 x 6 mm rhomboid slats made of extruded aluminum, slats somewhat opened, with two dividers for reinforcement, installed in a stable, continuous 70 x 30 mm frame made of extruded aluminum, baked enamel finish with surface in accordance with valid collection. Standard-equipped with electrical shifting from open, i.e. sash perpendicular to the facade, to closed and at every intermediate position. Sash with fixed, wide rhombic-section 60 x 15 mm slats made of extruded aluminum, slats with intermediate space, installed horizontally or vertically in a stable continuous 55 x 45 mm frame made of extruded aluminum, baked enamel finish with surface in accordance with valid collection. Standard-equipped with electrical shifting from open, i.e. sash perpendicular to the facade, to closed and at every intermediate position. Sash with fixed, narrow rhombic-section 35 x 15 mm slats made of extruded aluminum, slats with intermediate space, installed horizontally or vertically in a stable continuous 55 x 45 mm frame made of extruded aluminum, baked enamel finish with surface in accordance with valid collection. Standard-equipped with electrical shifting from open, i.e. sash perpendicular to the facade, to closed and at every intermediate position. Sash with fixed, wide rhombic-section 60 x 15 mm slats made of extruded aluminum, slats with intermediate space, installed horizontally in a narrow, continuous 42 x 31 mm frame made of extruded aluminum, baked enamel finish with surface in accordance with valid collection. Standard-equipped with electrical shifting from open, i.e. sash perpendicular to the facade, to closed and at every intermediate position. Sash with fixed, narrow rhombic-section 35 x 15 mm slats made of extruded aluminum, slats with intermediate space, installed horizontally in a narrow continuous 42 x 31 mm frame made of extruded aluminum, baked enamel finish with surface in accordance with valid collection. Standard-equipped with electrical shifting from open, i.e. sash perpendicular to the facade, to closed and at every intermediate position. Sash with fixed 60 x 15 mm slats made from untreated Siberian larch, slats with intermediate space, installed in a stable, continuous 55 x 45 mm frame made of extruded aluminum, baked enamel finish with surface in accordance with valid collection. Standard-equipped with electrical shifting from open, i.e. sash perpendicular to the facade, to closed and at every intermediate position. Sash with fixed 60 x 15 mm slats made from untreated Siberian larch, slats with intermediate space, installed horizontally in a narrow, continuous 42 x 31 mm frame made of extruded aluminum, baked enamel finish with surface in accordance with valid collection. Standard-equipped with electrical shifting from open, i.e. sash perpendicular to the facade, to closed and at every intermediate position. Sash with lining made of polyester fabric Soltis 92 or 86, fastened in place in the frame with weather stripping profile and stretching screws. Lining in a stable, surrounding 70 x 30 or 40 x 40 mm frame made of extruded aluminum, baked enamel finish with surface in accordance with valid collection. Standard-equipped with electrical shifting from open, i.e. sash perpendicular to the facade, to closed and at every intermediate position. Sash with lining made of polyester fabric Soltis 92 or 86, fastened in place in the frame with weather stripping profile and stretching screws. Lining in a narrow surrounding 55 x 45 mm frame made of extruded aluminum, baked enamel finish with surface in accordance with valid collection. Standard-equipped with electrical shifting from open, i.e. sash perpendicular to the facade, to closed and at every intermediate position. Sash with filling made of 2 mm aluminum sheeting, beveled and riveted on frames at the top and bottom and on the sides. Filling in a stable, surrounding 70 x 30 mm frame made of extruded aluminum, baked enamel finish with surface in accordance with valid collection. Standard-equipped with electrical shifting from open, i.e. sash perpendicular to the facade, to closed and at every intermediate position. Sash with filling made of 2 mm aluminum sheeting, beveled and riveted on frames at the top and bottom and on the sides. Filling in a narrow, surrounding 40 x 31 mm frame made of extruded aluminum, baked enamel finish with surface in accordance with valid collection. Standard-equipped with electrical shifting from open, i.e. sash perpendicular to the facade, to closed and at every intermediate position. Sash with filling made of 2 mm aluminum sheeting with perforation, beveled and riveted on frames at the top and bottom and on the sides. Filling in a stable, surrounding 70 x 30 mm frame made of extruded aluminum, baked enamel finish with surface in accordance with valid collection. Standard-equipped with electrical shifting from open, i.e. sash perpendicular to the facade, to closed and at every intermediate position. Sash with filling made of 2 mm aluminum sheeting with perforation, beveled and riveted on frames at the top and bottom and on the sides. Filling in a narrow, surrounding 40 x 31 mm frame made of extruded aluminum, baked enamel finish with surface in accordance with valid collection. Standard-equipped with electrical shifting from open, i.e. sash perpendicular to the facade, to closed and at every intermediate position. Sash signature line made of 2 mm aluminum expanded metal with approx. 10% view, riveted all around in the frame on the surface side. Signature in a stable, surrounding 55 x 45 mm frame made of extruded aluminum, baked enamel finish with surface in accordance with valid collection. Standard-equipped with electrical shifting from open, i.e. sash perpendicular to the facade, to closed and at every intermediate position. Sash signature line made of 2 mm aluminum expanded metal with approx. 10% view, riveted all around in the frame on the surface side. Signature on a narrow surrounding 42 x 31 mm frame made of extruded aluminum, baked enamel finish with surface in accordance with valid collection. Standard-equipped with electrical shifting from open, i.e. sash perpendicular to the facade, to closed and at every intermediate position. Sash signature line made of 8 mm Fundermax Uni-Decor plate, riveted all around on the frame, color and surface in accordance with valid collection. Signature in a stable, surrounding 70 x 30 mm frame made of extruded aluminum, baked enamel finish with surface in accordance with valid collection. Standard-equipped with electrical shifting from open, i.e. sash perpendicular to the facade, to closed and at every intermediate position. Sash signature line made of 8 mm Fundermax Uni-Decor plate, riveted all around on the frame, color and surface in accordance with valid collection. Signature on a narrow surrounding 42 x 31 mm frame made of extruded aluminum, baked enamel finish with surface in accordance with valid collection. Standard-equipped with electrical shifting from open, i.e. sash perpendicular to the facade, to closed and at every intermediate position. Stable pantograph technology with sashes fastened to pantograph, made of stainless steel, automatic locking, with Type G continuous runner rail for pantograph shutters made of extruded aluminum, transparently anodized, on punctiform installation brackets, screen for covering the runner rail and interior pantograph parts, baked enamel finish with surface in accordance with valid collection, with pantograph system at top, with 24 V DC motor installed. Continuous Type H guide rails, transparently anodized, for floor or wall installation, with scissor system at bottom. Stable pantograph technology with sashes fastened to pantograph, made of stainless steel, automatic locking, with Type G continuous runner rail for pantograph shutters made of extruded aluminum, transparently anodized, on punctiform installation brackets, screen for covering the runner rail and interior pantograph parts, baked enamel finish with surface in accordance with valid collection, with pantograph system at top, with 24 V DC motor installed. Continuous Type H guide rails, transparently anodized, for wall installation, with scissor system at bottom.